I feel the need to start this post by saying that this was supposed to be a recipe for Mexican Posole. Of course, I had a bit of trouble with the one ingredient needed to make an actual posole- the hominy. I have heard many people say that they usually used canned hominy, but I decided to use dry hominy since that was what was in the pantry. Recalling my artichoke disaster, I am noticing a trend that apparently canned food works better for a lot of things. Luckily, I had a feeling the dry hominy would take a long time to cook and decided to cook it separately, rather than cooking it in the stew. I must have refilled the pot with water at least four times, but the hominy still wasn’t getting soft. I don’t know what I did wrong, but I had to improvise from there. I decided that white kidney beans would be a good substitute for the hominy, since they kind of have a similar texture. This recipe can be altered to fit your appetite by adding more vegetables or taking away any that you don’t like or by switching up the type of meat in the stew. 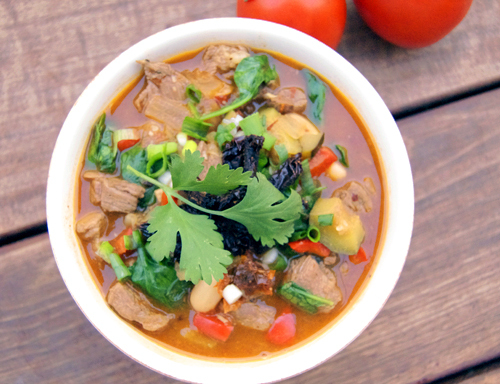 I love adding lots of vegetables to stews because it is such an easy way to add nutritional foods to you meal and creates unique flavor combinations. I like the addition of sun-dried tomatoes in this stew because they add a unique smoky flavor to the stew that you normally wouldn’t get if you were using regular tomatoes. If you are not a fan of spicy food, I do not suggest using the chipotle peppers; they are very spicy. If you like spice, they add a delicious zing to the stew that I love. Use this recipe if you would like or switch it up to come up with your own combination, either way I’m sure it will come out delicious. If you want to make Mexican Posole, like this was supposed to be, simply substitute hominy for the beans- but make sure the hominy is cooked first! In a large pot, heat the chicken broth, tomato paste, chipotle peppers, oregano and parsley over medium heat, stirring occasionally. 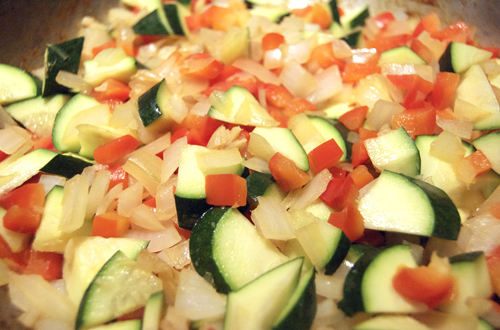 In a large skillet, sauté the the onion, red pepper and zucchini over medium-high heat until soft (about 5 minutes). Add garlic and cook for an additional minute. Add the sauteed vegetables and sun-dried tomatoes to the chicken broth and stir until well combined. In the skillet, sear the flank steak cubes until cooked through and season with the salt and pepper. Add the beans and steak to the stew, bring to a boil, cover then reduce heat and let simmer for 30 minutes. Stir the spinach into the stew, ladle into bowls and garnish with cheese (optional), green onions and cilantro before serving. I love all the veggies that are in here! This stew looks so comforting and filling. I am marking it to try soon! I love this recipe and will try for sure! Your photos are great too! Lovely post and the recipe looks wonderful. The photo is great and congrats on being featured on foodbuzz! Too bad about the hominy but you turned it into one delicious looking stew. Congrats on the Foodbuzz top 9! 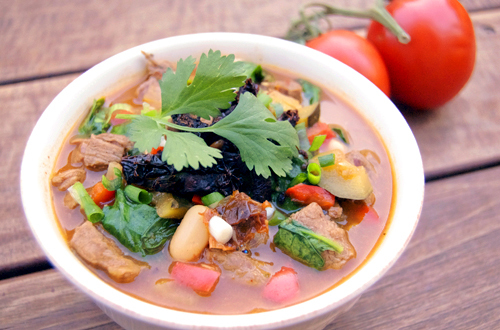 what a nice and hearty summer soup!!! and your photos are beautiful! congrats on the top 9! This soup is just wonderful!